CrackMagik is the ideal quick fix when it comes to exterior cracks up to 1/8" in mortar joints on chimneys, brick, or stone walls. It keeps water out where water repellent alone comes up short. Just brush on CrackMagik with one of the two specially designed brushes that are included with each container. A half-gallon container will treat the mortar joints in approximately 100 sq. ft. of brick surface without significantly changing the appearance on most walls or chimneys. 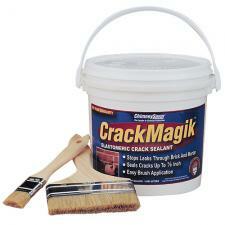 CrackMagik leaves a slight gloss on dense surfaces. When used to fill larger cracks, it will dry to a translucent milky film. It works to seal water out while allowing internal moisture to escape. With CrackMagik you can solve a lot of tough leak problems without the expense of tuckpointing or surface grouting. Manufacturer recommends product be stored where temperatures don't go below 40 degrees. Product will solidify when too cold. Comes with a 10 year warranty.